Instead of stumbling over the scattered toys in your kids’ playroom and constantly scolding them about it in vain, try those strategies of storage that will take neither much effort nor budget. 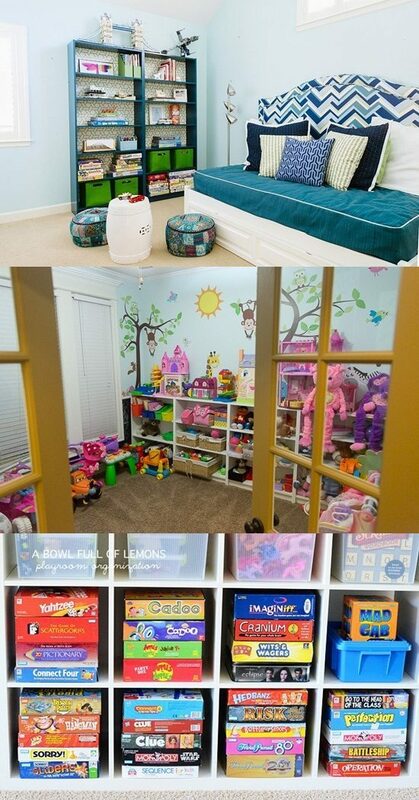 For starters, the playroom should be divided into several sections according to the kids’ activities. For example, save a corner for computer games, the other one for reading, writing and taking naps, other corner for art projects, and another one for the puzzles and other activities. And in each section, manage to have cube shelving and baskets for storing the toys and items that belong to each activity. This doesn’t need a huge room to be achieved and it will teach your kids organizational skills and some important values. Label each toy storage bin by category and place those bins in the bottom shelves to be easily accessible. Make sure that tall shelves are anchored to the wall. Also, make your kids contribute in choosing the color of bins, walls, and in other arrangements. If they did, it will be much easier for them to keep the room clean. Toss some beanbags or allow for a carpeted floor in order to maintain the kids’ safety. Likewise, when you pick up the furniture pieces, avoid the edgy and pointed ones. If you’re compacting the playroom with the living room or with the kids’ bedroom and you need to maximize space, then here are some tips. In the kids’ bedroom, allow for storage beds or trundle day beds; they are of dual functions and are usually loved by kids. If they usually play in the living room, then purchase storage containers that match the surrounding furniture in material or color. They could be hidden in cabinets or in a chest table in case guests come over. Also, provide a nesting table to save extra surface area for various activities. What is 3 multiplied by 8?